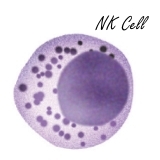 Natural Killer Cells are the Navy Seals of your immune system. They quickly and aggressively eliminate viruses, bacteria and cancer cells. If you live in a tree-rich environment, you inhale all kinds of substances that make Natural Killer Cells more effective and aggressive. In 2006, Japanese researchers from Nippon Medical School published a study that shows how. The researchers experimented with human Natural Killer Cells. In test tubes, the Japanese exposed these cells to very small concentrations of hinoki oil [the volatile oil of the conifer Chamaecyparis taiwanensis], white cedar oil, alpha-pinene and 1,8-cineole. Alpha-pinene is found in volatile oil of conifers, but also in rosemary. 1,8-cineole is found in the volatile oil of the camphor tree, but also in herbs such as mint, thyme, basil, and sage. The concentrations used by the Japanese could theoretically occur in the body of people who breathe in these essential oils and substances. The Japanese already these substances phytoncides. Trees manufacture them to protect themselves against diseases and pests, but they also stimulate our immune system, the Japanese think. When the Japanese let their Natural Killer Cells interact with cancer cells, they saw that the Natural Killer Cells killed more cancer cells in the presence of essential oils, alpha-pinene and 1,8-cineole. Below you see how essential oils, alpha-pinene and 1,8-cineole made the Natural Killer Cells more effective, you can see below. Because of the exposure to these substances, the Natural Killer Cells made more perforin, granulysin and granzyme-A. These substances enable Natural Killer Cells to attack cancer cells and cells infected with viruses. Perforin, granulysin and granzyme-A are agressive enzymes that can literally dissolve the cell membranes of faulty cells. "Phytoncides significantly enhance human Natural Killer Cell activity, and this effect at least partially is the result of increased expression of intracellular cytolytic molecules as perforin, granzyme A, and granulysin", write the researchers. "Although the underlying mechanism of phytoncide-induced increases in intracellular perforin, granzyme A, and granulysin requires further study, the present findings strongly suggest that forest bathing may have beneficial effects on human immune function." "We are planning to investigate this effect in a field study." That field research has already been completed. Links to post about it below. If you think you should start training but you're not sure whether you'll manage to keep it up, if at all possible go and train outdoors. Living in the vicinity of parks, gardens and other urban green spaces may reduce the risk of breast cancer. Training in green surroundings is good for your mental health, according to psychologists at the University of Essex.